Entrepreneurs, corporate managers and nonprofit administrators should look at intellectual property as a key strategic asset. Most managers leave intellectual property issues to the legal department, unaware that an organization’s intellectual property can help accomplish a range of management goals, from accessing new markets to improving existing products to generating new revenue streams. 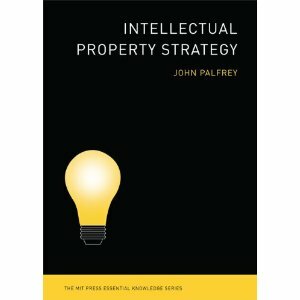 In his new book, Intellectual Property Strategy (MIT Press), intellectual property expert, head of the Harvard Law School Library, and Berkman Center faculty co-director John Palfrey offers a short briefing on intellectual property strategy for them. Palfrey argues for strategies that go beyond the traditional highly restrictive “sword and shield” approach, suggesting that flexibility and creativity are essential to a profitable long-term intellectual property strategy--especially in an era of changing attitudes about media. Join us for a discussion on the book and a demonstration of an iPad app that will offer interactive media features with leaders in the IP field, and showcase new ways in which innovative organizations and people can employ multiple intellectual property approaches . The book is part of the MIT Press Essential Knowledge series, which presents short, accessible books on need-to-know subjects in a variety of fields, written by leading thinkers. John Palfrey is Henry N. Ess Professor of Law and Vice Dean for Library and Information Resources at Harvard Law School. He is the co-author of "Born Digital: Understanding the First Generation of Digital Natives" (Basic Books, 2008) and "Access Denied: The Practice and Politics of Internet Filtering" (MIT Press, 2008). His research and teaching is focused on Internet law, intellectual property, and international law. He practiced intellectual property and corporate law at the law firm of Ropes & Gray. He is a faculty co-director of the Berkman Center for Internet & Society at Harvard University. Outside of Harvard Law School, he is a Venture Executive at Highland Capital Partners and serves on the board of several technology companies and non-profits. John served as a special assistant at the US EPA during the Clinton Administration. He is a graduate of Harvard College, the University of Cambridge, and Harvard Law School.